The eyesore that was once Chandler Elevation is a thing of the past and in its place is rising a six-story masterpiece. 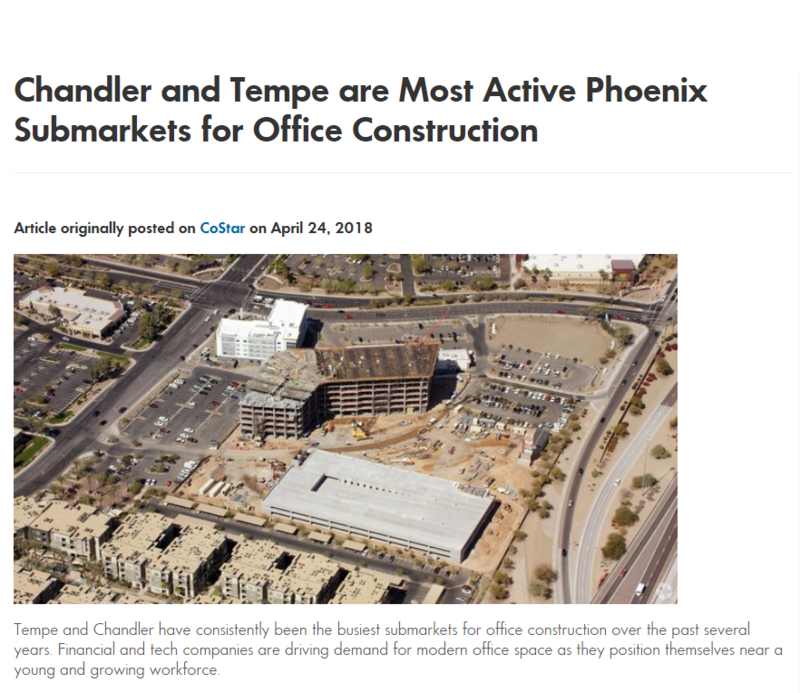 The focal point of the Chandler Viridian development by Hines is a 248,700-square-foot Class A office building that is just a few months away from being occupied. The Chandler Viridian master plan development is a 25-acre mixed-use project which includes the Offices at Chandler Viridian, a Cambria hotel & suites, Broadstone Fashion Center luxury apartments, retail and restaurant offerings and a pedestrian promenade to the Chandler Fashion Center mall. Starlight U.S. Multi-Family recently acquired Broadstone Fashion Center for $84 million, according to Business Real Estate Weekly. The $4.315 million sale of Panera Bread at Chandler Viridian recently set a national record for the highest sale price for the chain, according to AZRE Magazine. Construction of Chandler’s tallest multi-tenant office building took another step toward its fall completion as Hines, the international real estate firm, topped out the Offices at Chandler Viridian. The last concrete beam was recently placed atop the Offices at Chandler Viridian, a six-story, Class A office building with 250,000 square feet of space at the intersection of Loop 101 and Loop 202 near the Chandler Fashion Center. PHOENIX, Arizona – Hines, the international real estate firm, has topped out the Offices at Chandler Viridian, the capstone to a mixed-use project that marks a new era for an important site in Chandler. 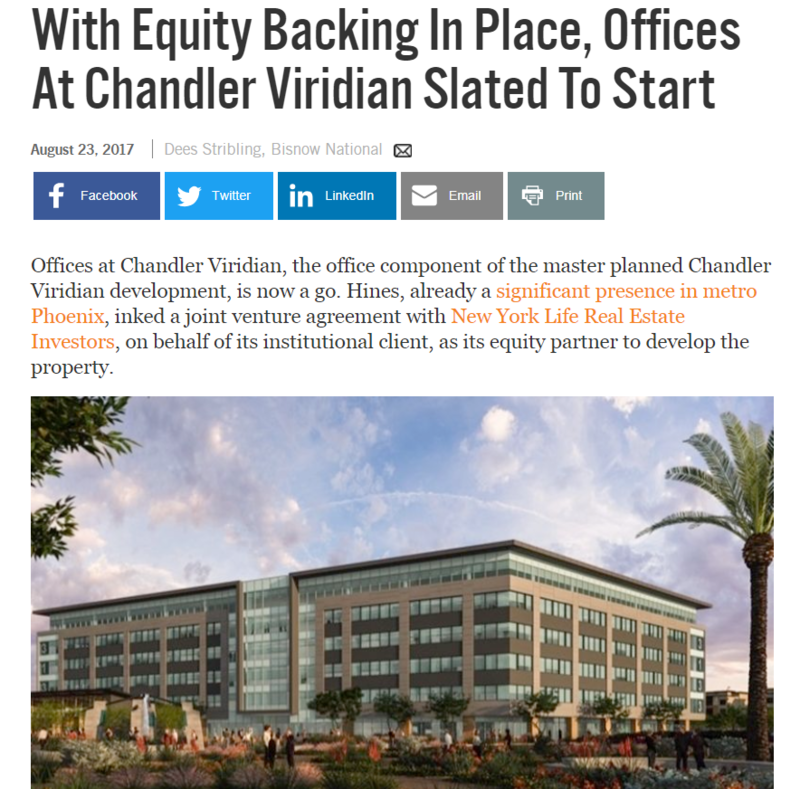 ​PHOENIX, Arizona – Hines, the international real estate firm, has topped out the Offices at Chandler Viridian, the capstone to a mixed-use project that marks a new era for an important site in Chandler. 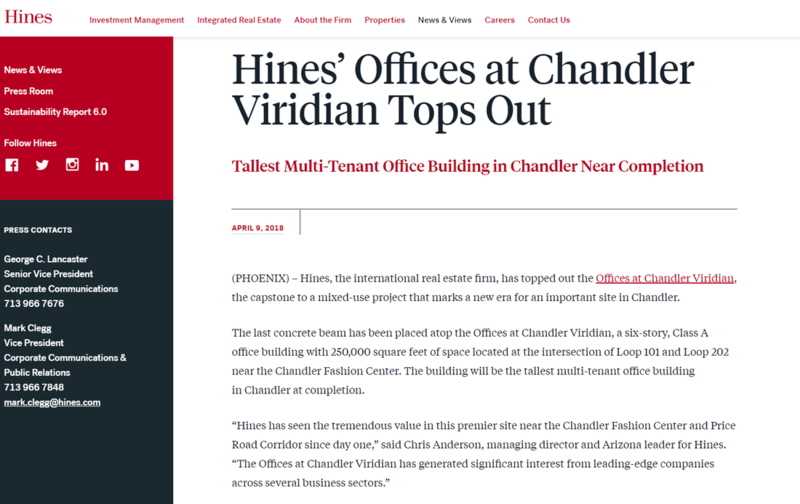 (PHOENIX) – Hines, the international real estate firm, has topped out the Offices at Chandler Viridian, the capstone to a mixed-use project that marks a new era for an important site in Chandler. The last concrete beam has been placed atop the Offices at Chandler Viridian, a six-story, Class A office building with 250,000 square feet of space located at the intersection of Loop 101 and Loop 202 near the Chandler Fashion Center. The building will be the tallest multi-tenant office building in Chandler at completion. 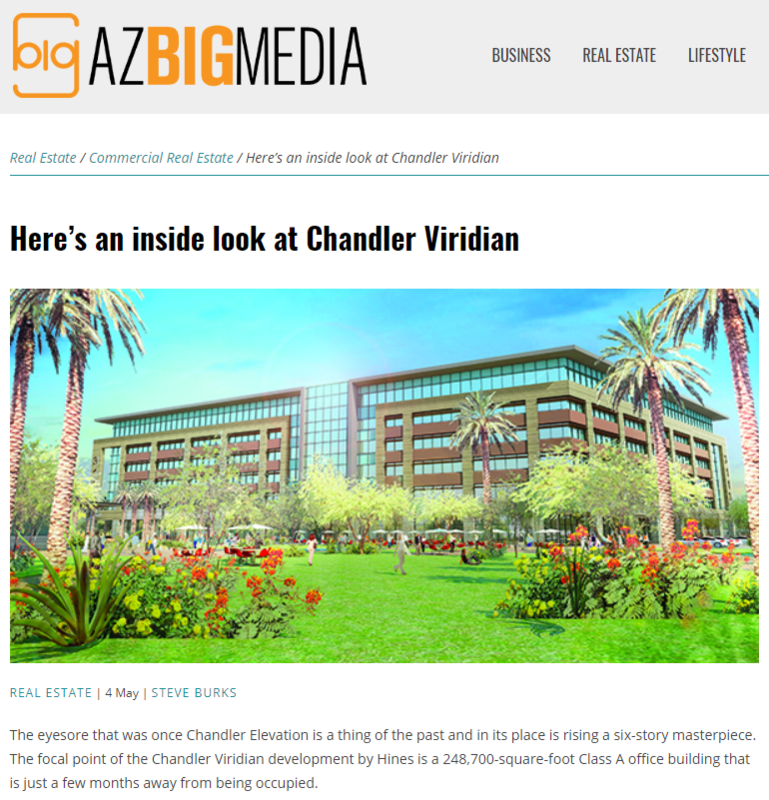 Offices at Chandler Viridian, the office component of the master planned Chandler Viridian development, is now a go. Hines, already a significant presence in metro Phoenix, inked a joint venture agreement with New York Life Real Estate Investors, on behalf of its institutional client, as its equity partner to develop the property. The Offices at Chandler Viridian will be a 250K SF office building at the intersection of Loop 101 and Loop 202, near the Chandler Fashion Center. Story also posted on Rose Law Group Reporter. 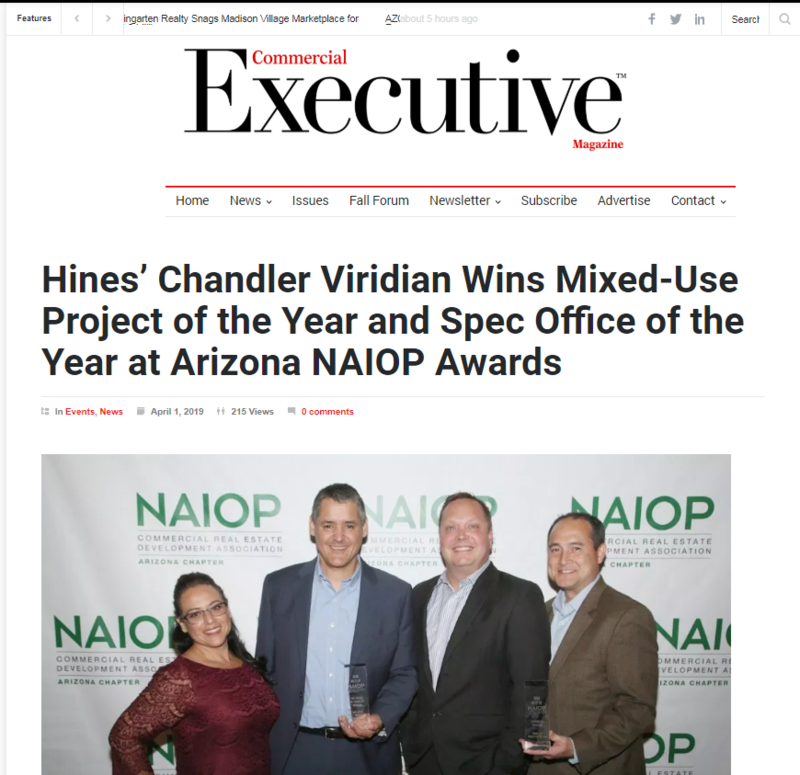 Phoenix, Ariz. – Hines, the international real estate firm, recently won Mixed-Use Project of the Year and Speculative Office of the Year for its Chandler Viridian project at the 2019 Best of NAIOP Arizona Awards. 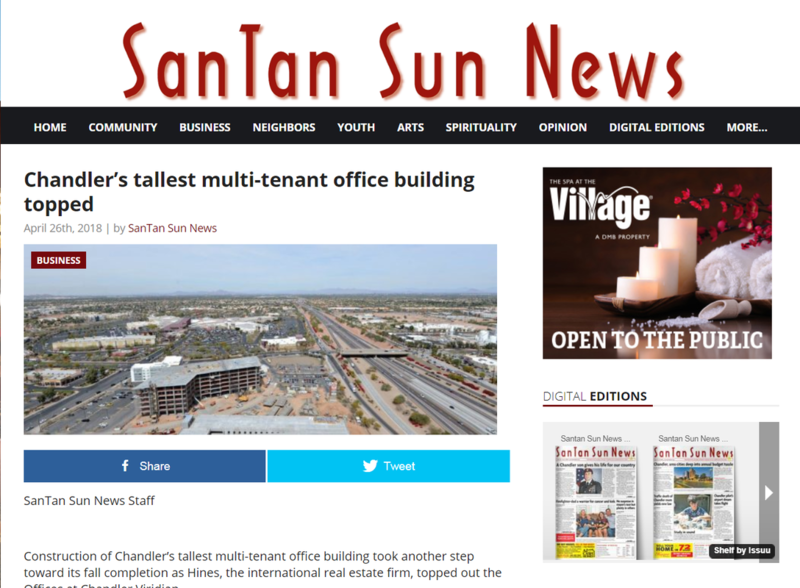 The Offices at Chandler Viridian is the tallest multi-tenant office building in Chandler. Current tenants include Stantec, a global engineering, architecture and consulting firm, and Workuity, a coworking firm. Recently completed, Hines hosted the building’s grand opening in January 2019. 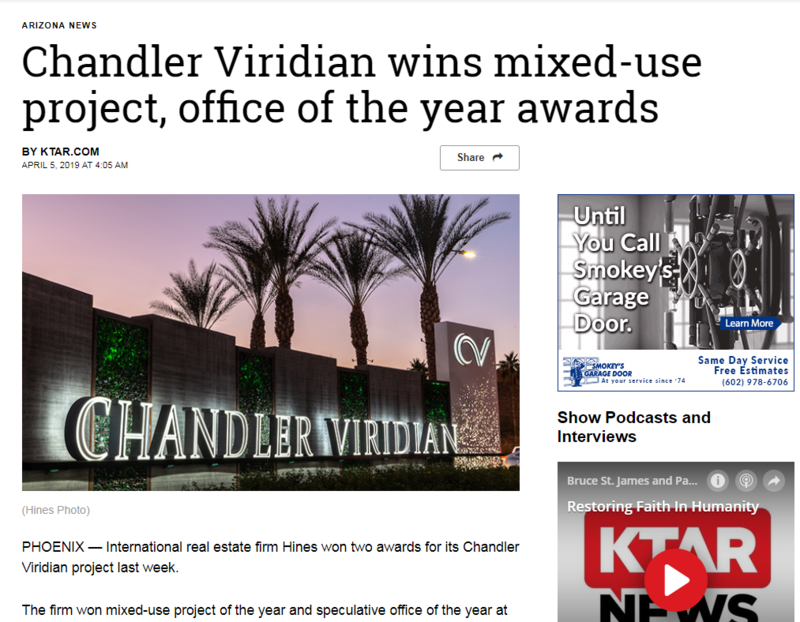 Chandler Viridian also won NAIOP Arizona’s Transaction of the Year in 2015.